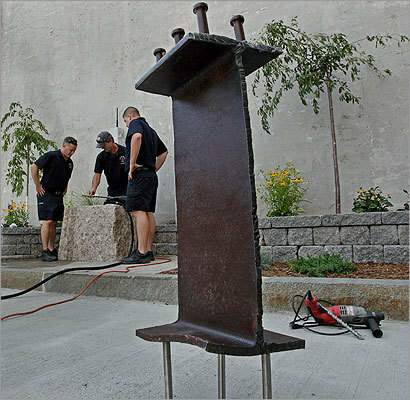 In August, outside the Salem Fire Headquarters on Layfayette Street, firefighters worked on a memorial to the 9/11 victims. They drilled holes in the top of a granite block where a piece of steel (foreground) from the World Trade Center site will be mounted. The 3-1/2 -foot piece of steel is the centerpiece of the memorial, honoring the nearly 3,000 people who died 10 years ago in New York, Pennsylvania and Washington, D.C.
Left to right are Tom Brophy, Lieutenant Scott Hebert, and Manny Ataide.